As we continue on with highlighting woolens, I thought it would be great fun to feature a fabric every Friday. There are many varieties of wool out there and if I do say so myself, it's awesome to know what you're buying or what you have already. Today, I'm giving it up to wool gabardine. Let's break this all down now. Wool is the fiber type - I'll be going over different kinds of wool fiber next week, so then you'll be a wool ninja! - and gabardine is the weave structure. Do y'all know what weave structure is? I don't know if you've ever actually seen a weaving loom, but I've seen several. Strange, strange coincidence is that here in Utah, there are a lot of ladies who weave their own cloth. It's fascinating really. I can't tell you all the gory details about weaving (because I don't know any! ), but I do know that there are basic weave structures and one of them is twill. Gabardine is a twill. This basically means that when you look at it closely, the yarns look diagonal - like denim! Yes, denim, that fabric your jeans are made of is a twill weave. The thing that is different about wool gabardine is that it's always drapey. I have to be honest and say I'm not exactly sure what gives gabardine its drape, but it's got nice flow. 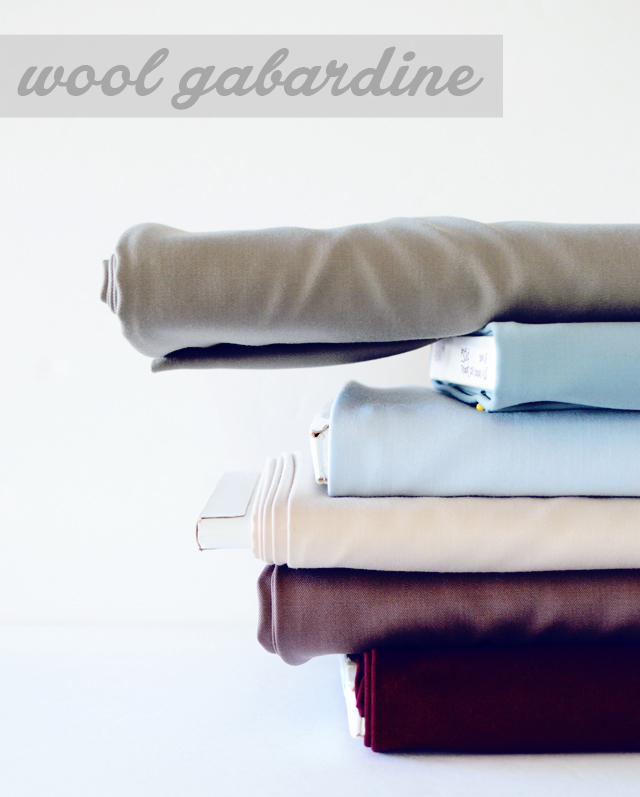 Wool Gabardine is a medium weight fabric and works nicely for jackets, pants, dresses and skirts. Think suiting. Remember these pants? Those are a luscious bright red wool gab. You'll find that with wool fabrics, you can do a lot of different things design/sewing wise. For example, the same wool fabric that can be used to make a flowy dress, can also be used to make a tailored jacket. This is the lovely thing about wool - its versatility. Have you worked with wool gab before? Do you have wool gab in your stash? I love this idea Fabric Friday. 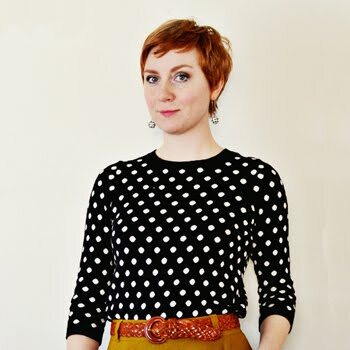 I've been looking for websites that provide you with a list of fabrics and what type of garments you can create with it. And here you are showing us a garment as well with valuable tips on the fabric! Many thanks. Looking forward to next Friday. The wool gabardine I ordered from your shop during the black friday sale has just arrived today actually! I'm trying to decide how to pretreat it now. Sunni, thank you so much for all this fabric information. I love it!!!! I have wondered what the difference was between some of the wools & this post, along with the others, has been so great. Thank you, thank you, thank you for taking the time to inform us. By the way, I ordered some of the cotton jersey fabric from you & love it. Can't wait for things to settle down so I can make a Renfrew T shirt with it. I love anything wool. Thanks for this! I've taken a few high-end tailoring classes. We were always instructed not to us gabardine because it is an unforgiving fabric and unsuitable for people without a lot of experience. Flannel or tweed were recommended instead. I prefer those two to gabardine, which for my taste is too hard and slick for the clothes that interest me. There are cotton twills and silk twills as well as woolen ones. 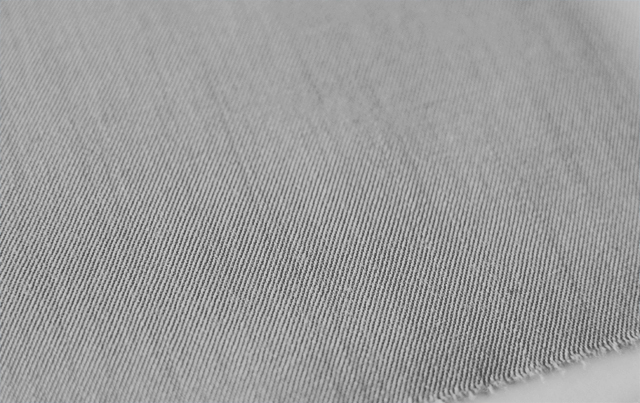 Silk faille and rep, used in tie making, is a form of twill weave, for example. I find that wool gabardine is actually pretty forgiving with a pre-wash. For this tightly woven fabric I wash in cold on gentle cycle and hang to dry. Give it a good iron and you're ready to go! Love those red pants! Wool gabardine is one of my favorite materials to work with. It looks so classy but easy to sew up! So glad you're loving the cotton jerseys Tina! Means a lot to hear you say that. Also glad that people are finding this info useful. I've found that so many customers who come into the store don't know what certain fabrics are - not a bad thing at all - but when you know, and especially when you're ordering online, you know what you're purchasing. Really helps a bunch! Me too! I LOVE wool with serious passion! Yes, I can definitely see this. It is unforgiving because it will show every single blemish you made where tweed or flannels won't necessarily. But I still love the occasional gab for a pair of trousers or even a nice skirt or structured sheath dress. I find that gabardine holds up quite well to a lot of wear and tear too. I've worn my red trousers quite a bit - even laundered them quite a bit too and they look like I just made them. Didn't even think about the bias woven in! Thank you LinB! Fascinating about the Wrangler jeans too. I love knowing stuff like this! I agree. It takes a lickin and keeps on tickin too. Wow those pants are awesome! I love sewing with wool. You can pretty much mold it any way you want! The most stable weave is the basic one over one under. Twill weave goes over two under one and that pattern moves diagonally across the fabric. This makes the fabric less stable and more drappy. I'm loving this series, we all learn as we go along. There is nothing like wool gabardine, especially for tailored pieces. 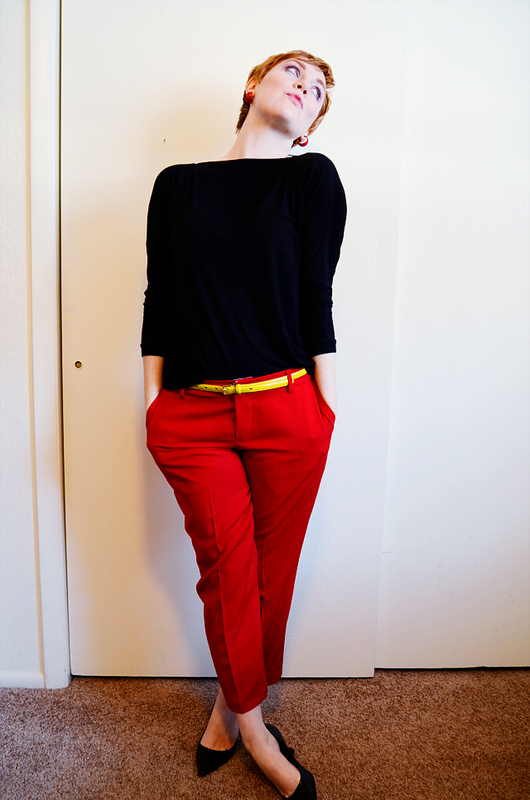 Love your red cropped pants. No I don't have a wool gabardine stash but I'm sure going to start one! I would add that wool gabardine is probably more drapey than something like cotton denim because of the difference between cotton and wool (cotton is inherently more stiff until the plant fiber breaks down, which is why cotton and linen and other plant fiber cloth gets softer over time) and the density of the sett. (The sett is how many strands of fabric per inch in the cloth. When you read about thread count, that is related to the sett of the weaving.) I would be curious to know, as one who DOES weave, what is the sett density and wool yarn weight for gabardine.